GRANVILLE, OH. 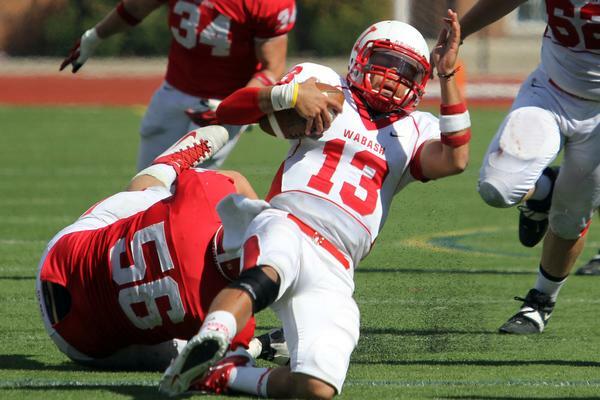 - Wabash's young and fast defense gave up a few yards but no points Saturday in a 35-2 North Coast Athletic Conference opener at Denison. 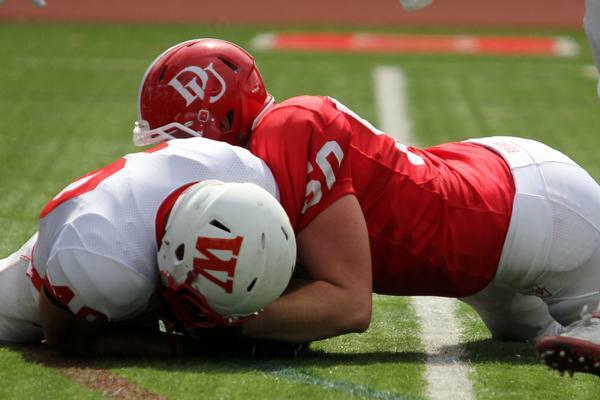 The Little Giants (2-0) picked off four passes and sacked the Big Red quarterback seven times to stifle the 0-2 hosts in their home opener. 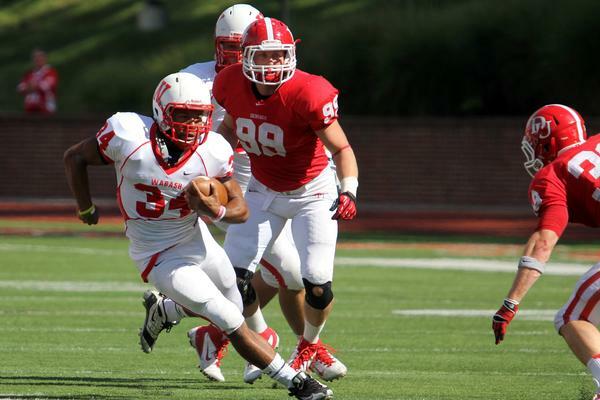 The Big Red offense moved the ball at times but turned the ball over or succumbed to the Little Giants smothering defense. 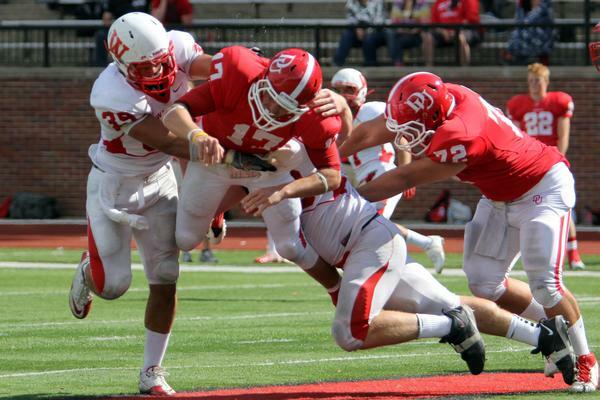 Besides the four interceptions and seven sacks, Denison also fumbled the ball over two times. 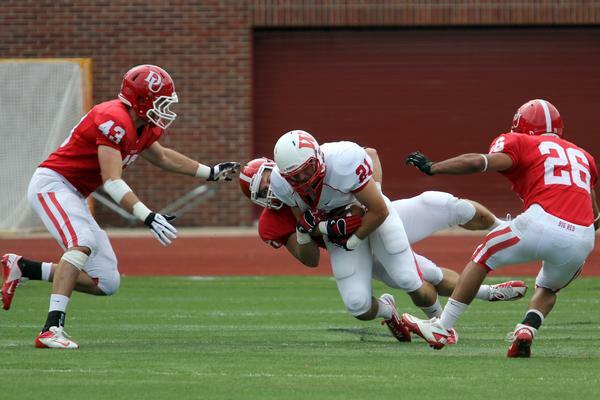 Sophomore linebacker Cody Buresh had one of the biggest games of his career. 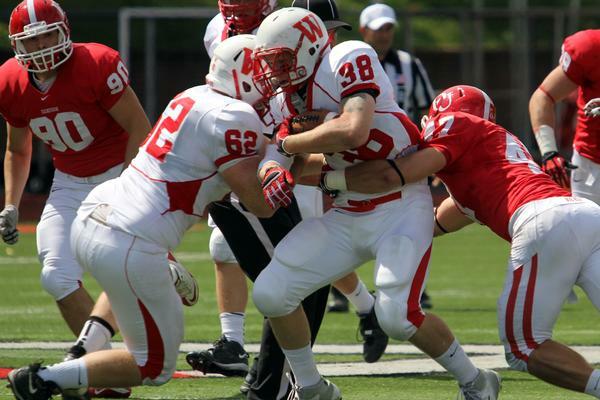 Buresh was credited with 11 tackles, forcing a fumble, and 3.5 quarterback sacks. The Michigan native said there was no special motivation after a lackluster season opener at Hanover. Raeburn said Buresh is simply a fantastic football player. 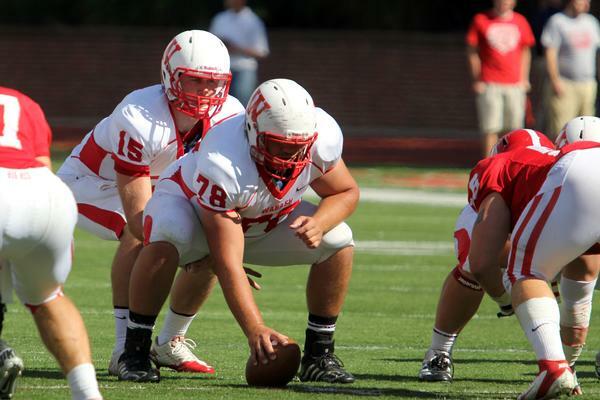 “He’s really a good player and does a great job of rushing the passer as well,” the coach said. 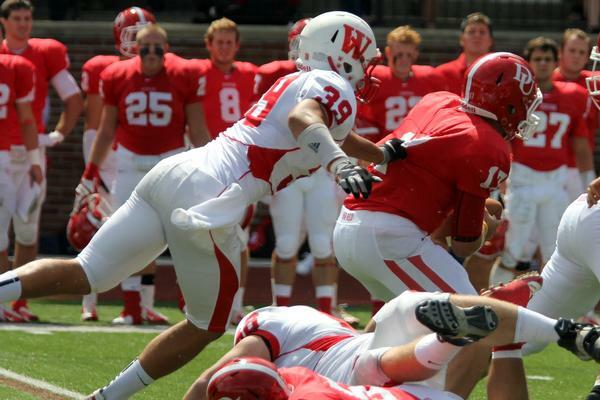 “We can use him as sort of a hybrid outside linebacker, or rush end guy. Cody was really solid today but so was our entire defense." The Little Giants got on the board late in the first period thanks to CP Porter. 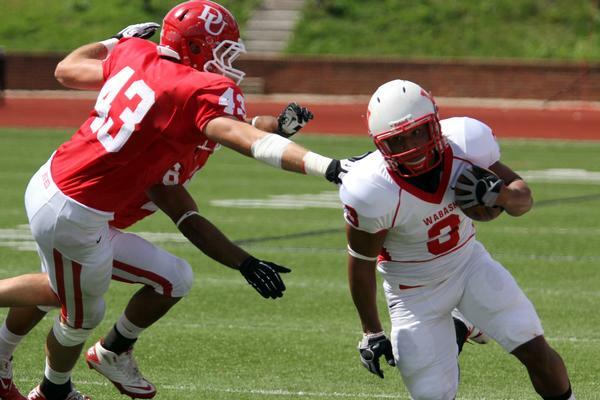 After a Chase Belton pass to tight end Darren Bost 13-yard connection, Porter broke around end for 32 yards. On the very next play, Porter went up the middle for 12 yards and the score, 7-0. 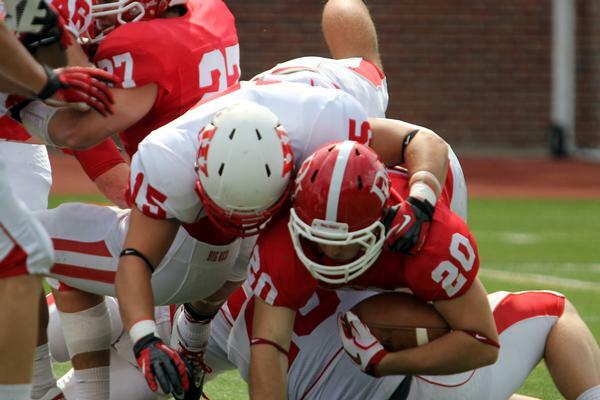 Belton had a seven yard run and a score later in the quarter to push the halftime margin to 14-2. Denison got its only points of the game pressuring Belton in the end zone and getting an intentional grounding call to net the two points. 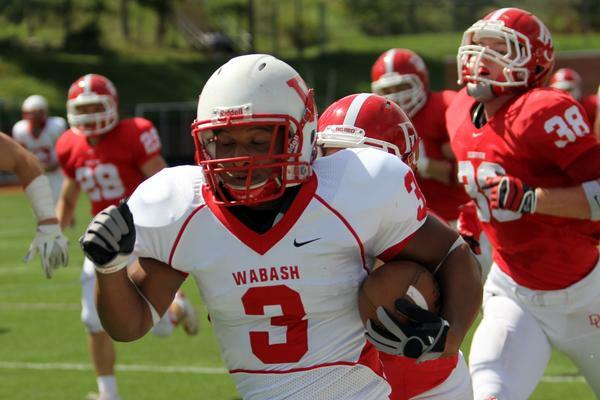 Wabash took control in the third with two scores. 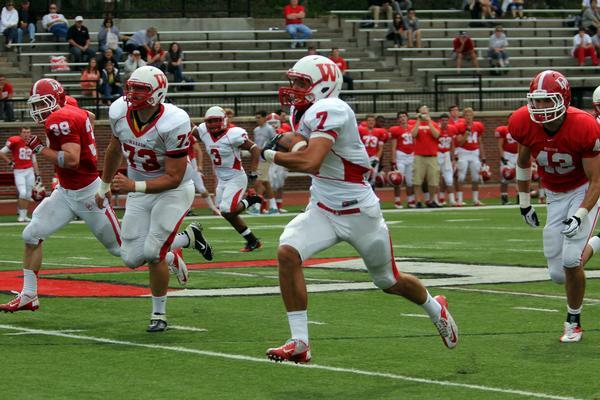 Newcomer Jon Laird took a short pass from Belton midway through the quarter and turned it into a 70-yard score, 21-2. 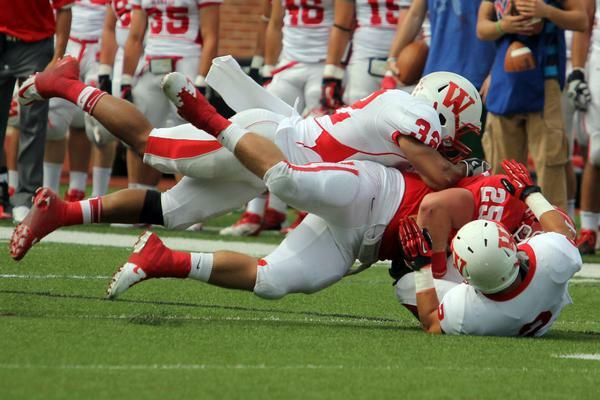 Things went south for Denison on the ensuing kickoff which was fumbled and recovered by Wabash freshman Mason Zurek. 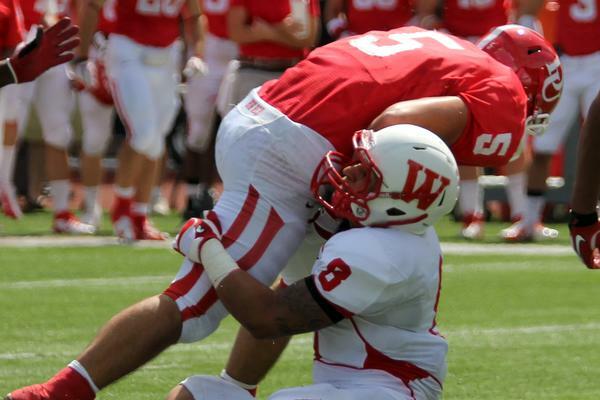 Wabash took advantage of the short field and scored on a nifty misdirection play. Belton found Andrew Gibson breaking to the left side of the end zone and hit him with an over-the-shoulder score, 28-2. The defense created another opportunity following a Jonathan Koop pick. 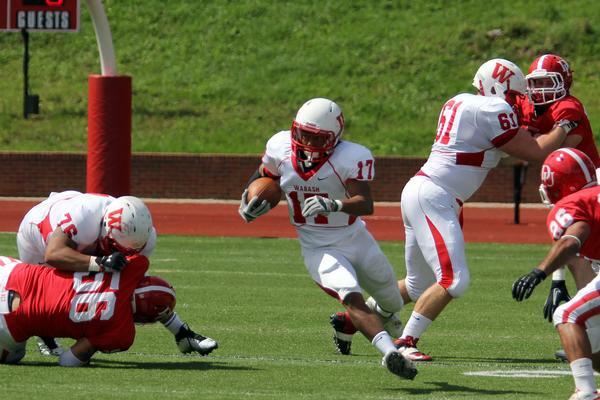 Mixing the pass and run, senior running back Vann Hunt capped the 12-play, 52 yard drive with a 3-yard TD run. 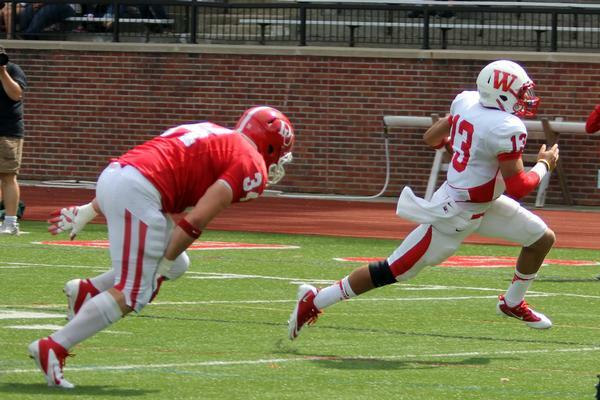 Belton had an efficient day hitting on 17 of 30 passes for 218 yards and two touchdowns. 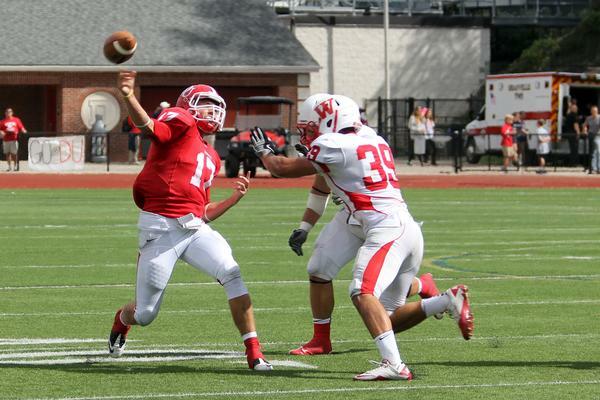 Afterwards, the senior quarterback lauded the improved play over the previous week. 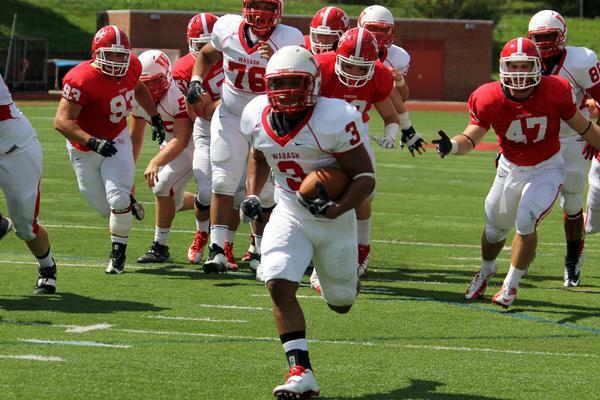 The Little Giants had a more effective running game Saturday with 126 yards. 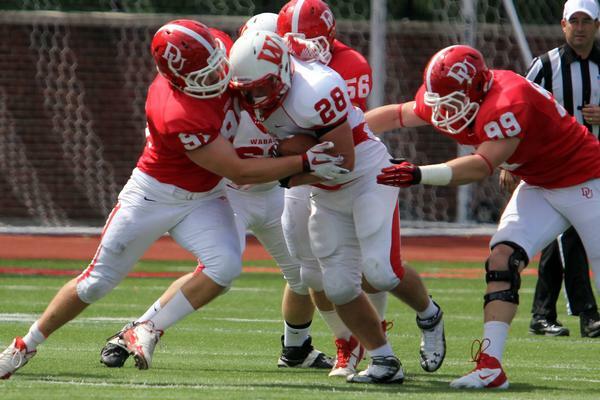 Porter’s 50 topped five Wabash ball carriers. 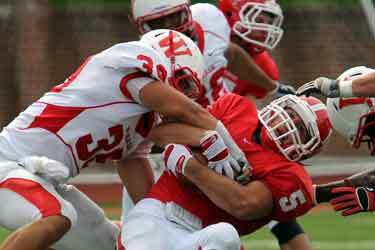 Denison accumulated 95 yards, with standout back Sam Fioroni getting 82 of the total. 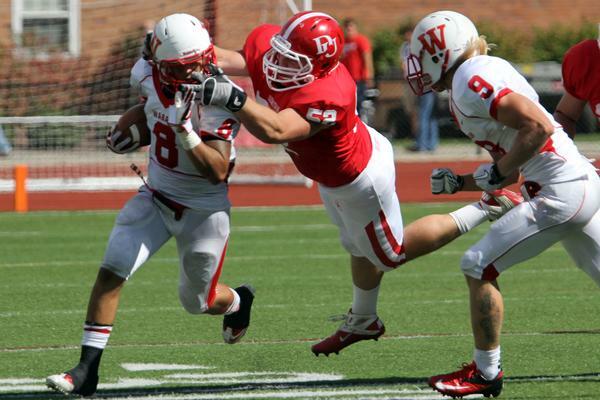 Belton really spread the ball around against the Big Red defense. Eight different pass catchers did so with Jon Laird compiling 82 yards on 3 balls. 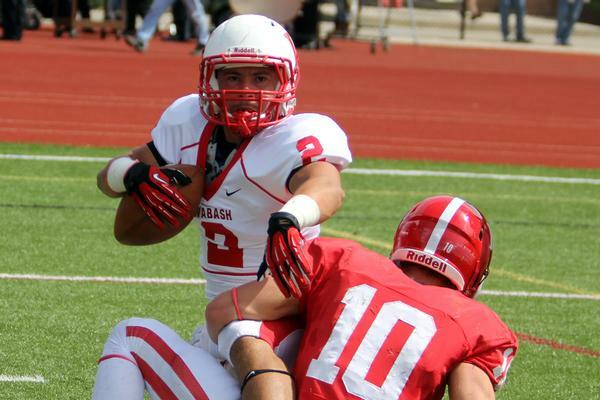 Running back Troy Meyers had the most receptions with four out of the backfield and 29 yards. 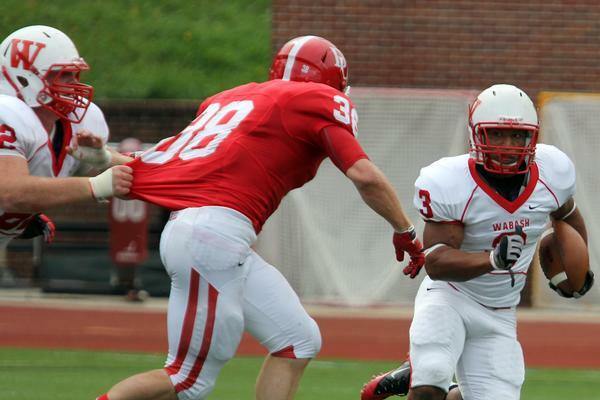 Andrew Gibson caught three passes for 34 while freshman Bost had two catches for 35 yards. Buresh’s monster game topped all Little Giant defenders. Austin Hodges had his second straight two interception game. 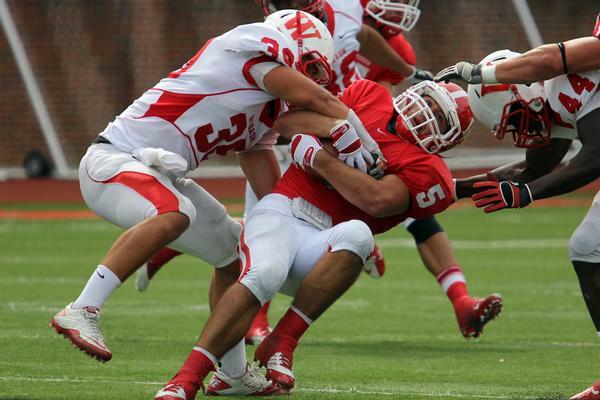 Linebacker Nate Scola continued his big comeback from a knee injury notching nine stops. Denzel Wilkins and Koop had eight stops apiece. 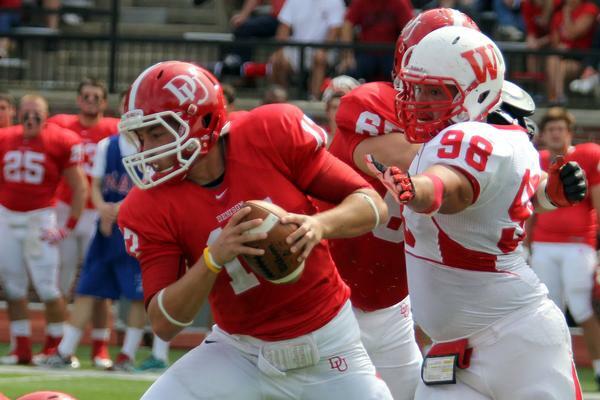 Freshman Tyler McCullen has started both games and made a big impact at Denison with three tackles and 2.5 quarterback sacks. So far the 18 year old hasn’t felt many nerves. The Little Giants will finally get to play in front of their always raucous home crowd Saturday when Allegheny (1-1) visits for Community Day.